VILSECK, Germany — Energy drinks have become the fastest-growing beverage product in the United States. Consumer demand have increased 60 percent since 2007, when energy drink and shot sales totaled more than $12.5 billion, with estimates of increases of up to $21.5 billion by 2017. Products carrying the “energy” label include packaged drinks, energy shots, drink mixes and extra heavily caffeinated soft drinks. Most rely on large amounts of caffeine, along with sugar and other additives, to temporarily boost energy. These beverages are especially popular among young adults and the military population. These are soft drinks containing ingredients, such as caffeine, designed to boost energy and stimulate the central nervous system. Energy drink manufacturers emphasize that their products will enhance performance, boost mental alertness, improve endurance, energy and decrease fatigue. Therefore, young adults often substitute energy drinks for regular healthy meals. Among the military population, these products are popular prior to and during workouts, physical training and sporting events. This can often lead to dehydration, tremors, heat stroke, and even heart attack. Energy drinks are also used as a replacement for sleep, which can lead to sleep deprivation. Lack of knowledge and education continues to draw young adults to energy drinks for perceived benefits. However, they are rarely aware of the harmful effects and potential dangers related to overindulgence due to the amounts of caffeine and sugar ingested from the drinks. Caffeine intoxication symptoms include nervousness, anxiety, restlessness, insomnia, gastro-intestinal upset and tachycardia. Symptoms are also similar to anxiety and mood disorder. And it’s not just the sugar in energy drinks that is wreaking havoc on our energy levels and stamina. Most popular energy drinks contain other stimulating products. 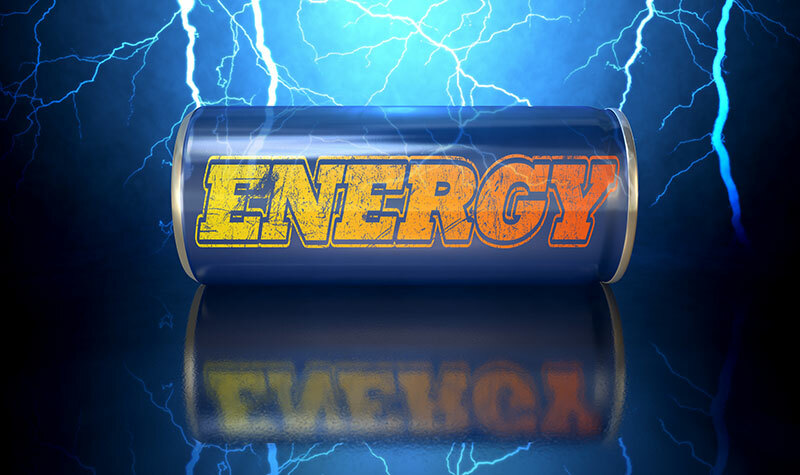 Let’s look at the ingredients in energy drinks and their effects. Ingredients typically found in energy drinks include caffeine, guarana, taurine, sugar, ginseng, and bitter orange. Caffeine is known as a mild stimulant, well absorbed with peak effect within 50-75 min from digestion. An average dose of 85-250 mg of caffeine may result in feeling of alertness, decreased fatigue, and improved concentration. Higher doses of caffeine, such as 250-500 mg, may result in restlessness, hyperactivity, nervousness, anxiety, insomnia, tremors, cardiac instability and seizures. The US Food and Drug Administration (FDA) regulated and limited caffeine content in sodas to 65 mg per 12 ounce can. However, there is no mandatory FDA requirement for energy drinks including caffeine content or warning labels listing potential dangers related to excessive consumption. In comparison, all European countries label drinks with more than 150 mg/L of caffeine as “high caffeine content.” In other countries, it is prohibited to sell energy drinks as soft drinks. Guarana is a plant with seeds containing three times more caffeine as compared to coffee beans, which amplifies the drink’s caffeine content. Taurine is an amino acid found in animals, which increases the effects of caffeine and decreases muscle fatigue. Sugar is a major source of energy for the brain, muscles, and other body cells. The US guidelines recommend a maximum sugar intake of 32 g for 2,000 calorie diet. A 16 and 24 ounce size energy drink contains 60-90 g of sugar, exceeding recommended daily intake by two to three times. Sugars in these drinks provide a “sugar high” followed by a “crashing” mode. Excess sugar can also cause diabetes, obesity and upsetting the gastrointestinal tract. Ginseng is also a plant believed to improve the immune system and overall well-being; however, levels of ginseng in energy drinks are way below therapeutic levels. Bitter orange is another plant which, when taken in combination with other stimulants like caffeine and guarana, increases the stimulating effects and can elevate blood pressure and heart rate. If you struggle with low energy or regularly feel fatigued, identifying a cause can be helpful in identifying effective strategies. Usually when people feel a need for an energy boost, it is due to low-blood sugar or dehydration. Blood sugars naturally drop 3 to 4 hours after a meal or 30 to 45 minutes after a high-sugar snack, prompting people to visit the candy machine or look for a caffeinated drink. There are healthy alternatives like eating certain foods that can provide extra energy and ingredients to repair the body rather than break it down. Some of these include: peaches, apricots, nectarines, plums, cherries, oranges, lemons, limes, bananas, dates, papaya, pineapple, apple sauce, pear sauce, red bell pepper, salmon, fortified cereals, carrots, almonds, spinach, beans, and Greek yogurt. If for some reason you can’t stay awake, good laughter or a cold shower will immediately perk you up.